RESORTS STYLE LIVING WITHOUT THE PRICE TAG. 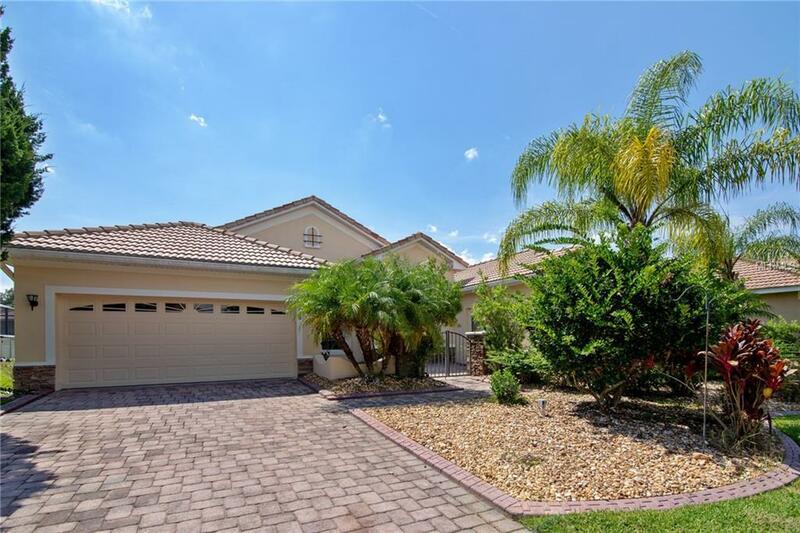 Don't miss your opportunity to be the proud owner of this BELLALAGO POOL HOME. This home offers over 2700 sq ft of living space. The tax record reads this as a 3 bed however the Bonus Room can easily be a 4th bed or a Media Room or Office. In addition there is a Separate Den/Study. Don't be fooled, THIS FLOOR PLAN JUST KEEPS ON GOING! As soon as you walk up to the home you will love the PRIVATE COURTYARD adding a touch of elegance. When you walk in you will appreciate the Open Layout offering a LARGE KITCHEN with plenty of Counter Space & Cabinet Space over looking the Breakfast Room and Great Room. All common and wet areas are Tiled and have been dressed w/ CROWN MOLDING & TRAY CEILINGS. The Den as well as the secondary bedroom are located on one side of the home. One of the secondary bedroom acts as a Jr. Suite with its own private bath that has DIRECT ACCESS TO THE POOL. On the opposite side of the home is the Owners Suite offering one of the largest Master Bedrooms Bellalago has to offer w/ a private sitting area & DIRECT ACCESS TO THE POOL. It also has 2 WALK IN CLOSETS & a Master Bath with Dual Sink Vanity, Jacuzzi Garden Tub and a separate shower. One of the best areas of this home is the backyard offering a covered area to relax and plenty of PRIVACY LANDSCAPING to enjoy your POOL and get some sun on the pool deck. The AC was replaced at the end of 2014. BELLALAGO LIVING IS A LIFESTYLE. Daily Activities, Pools, Parks, Walking Trails, Gazebos, 24hr Security & MUCH MORE ARE ALL INCLUDED! Call today!.